Deer hunting in early season heat is a whole different kettle of fish. 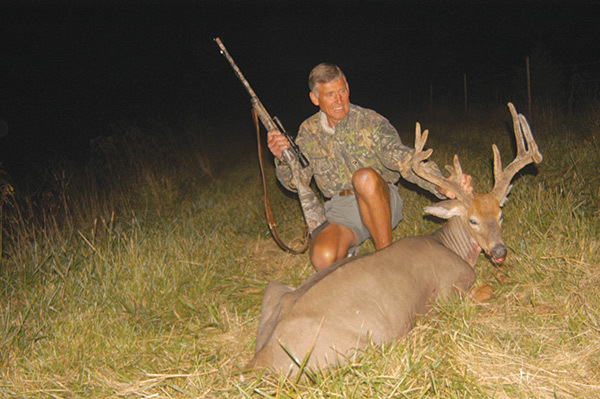 Often, tactics need to be amended from the planning stage right through recovery of the deer. Most states open deer seasons around the first of October, but a few start archery seasons in mid September, when conditions are more like summer than a traditional fall hunt. For the most part, deer at this time of year are only interested in three things: food, water and cover. And the smaller the area where they can avail themselves of all three, the better. Bucks are either still in velvet or just rubbing out and not traveling any more than absolutely necessary. They move from bedding cover to water or feed by the shortest and most obscure routes possible, and then only when daily temperatures are most comfortable. This limited movement, when combined with crops still in the fields and the concealing foliage of early autumn, can noticeably increase the difficulty for a hunter trying to set up within bow or even gun range of a deer. When afternoon highs are still bumping 80 degrees, I’d trade a stand over a water hole back in the timber for a half-dozen stands covering more open food plots. The farther back in the woods, the nearer the bedding area, the better. Deer may get a certain amount of their daily water from the dew on leaves eaten during early morning and late evening browsing. But when it is really hot and dry, this isn’t sufficient. A source of drinking water must be found, and the hunter who locates such a watering hole between feeding and bedding areas is well on his way to ambushing a hot-weather buck. I hunted the early season on the Omaha Indian Reservation across the river from our Iowa leases for a number of years, and two of my favorite stands overlooked water holes. One was a spring seep in a deep canyon surrounded by timbered ridges and slopes that encompassed prime bedding areas. The other stand was along a clear little creek that ran out of farm country through a half-mile stand of timber that included dense cedar thickets that also provided ideal bedding cover for deer. The spring was good mornings and evenings, but I learned quickly that I needed to get to the blind an hour earlier than usual in the morning. As deer moved out of the grain fields to bed down in the morning, they usually hit the spring in predawn darkness or shortly after daylight. For evening hunts, I tried to arrive no later than early afternoon because the deer hit the water sporadically throughout the day, and on a number of hot afternoons, I watched big bucks come to water and then head back to the bedding area on the slopes above. The hotter the day, the more the deer visited the little water hole. I dug a pit blind on the slope above that was perfect for most wind. The little creek was mainly an early morning stand, a stopover for deer on the way from the crop fields to the bedding areas. They’d hit the stream in the evening, too, but not until after dark most nights. In warm weather, deer tend to move earlier in the morning and again later in the evening, when temperatures are at their coolest and most comfortable. This gives a hunter far less opportunity to get on them during shooting light, and stands must be chosen and hunted with this in mind. I’m firmly convinced that when it stays hot day and night, mature trophy bucks can become totally nocturnal and all but impossible to hunt. At my Iowa hunting leases, I typically set trail cameras on food plots, water holes and travelways during mid August, when I am planting the Big-N-Beasty brassicas that have become a mainstay of my food plot mix. All of the cameras have exceptional battery life, which keeps them going long enough to monitor food plot growth in conjunction with undisturbed deer movement. During the early season, when daytime highs can be scorching, those cameras capture countless photos of shooter bucks in the food plots and on the water holes, but only during the middle of the night. They never take a photo of the same bucks during legal shooting hours. This tells me that the bucks simply are not moving during the day and therefore are not huntable, at least not with the stand-hunting techniques that most clients prefer. Of course, these same bucks will be vulnerable later, especially during the rut when they chase does during the day and again after the rut when cold weather forces them out into the open during the day, to feed and try to gain back the weight they lost chasing those does. During the early fall bow season in the famed Milk River area of Montana, whitetails are pretty much only hunted in the evening when they come out of dense river bottom bedding areas to feed in the adjacent grain and alfalfa fields. The lay of the land simply prevents other tactics from working; there’s no way to get into a stand in the morning without driving the deer out of the fields. They bed there during the night, feed early in the morning, and then head for cover at first light. A hunter is better served spending the mornings scouting to pinpoint better locations for evening hunts. My first evening there, I took a stand the outfitter had hung on a trail right at the edge of a barley field that the deer had been hammering. Unfortunately, the rancher had harvested the field the day before, and the deer had moved on to the upper end of a bordering field that was still standing. The next day at noon, we moved the stand to cover a trail to this unharvested field. That evening, as I sat and watched with growing frustration, the rancher came in and harvested that field right up until dark. There was a definite lack of communication between the rancher and the outfitter, who was paying him for the hunting rights. The rancher left a small strip unharvested on the far side of the field along a ditch line, and the next day, we moved the stand to overlook that location. The day was hotter than Hades, and by dark, only a smattering of does, fawns and small bucks had filtered into the field. Two big bucks didn’t show until well after shooting light. When the outfitter drove in to pick me up from the stand, even in the full dark of night, we could make out one of those bucks nonchalantly munching barley 20 yards away. Time was getting short, and I convinced the outfitter to move the stand 50 yards back into the woods on a trail coming out of the bedding area. This was pushing the envelope, and to keep things as normal as possible, we drove in at noon on the rancher’s tractor (they had made up by then), slipped the stand into place as quickly and quietly as possible, and then I stayed in the stand as the outfitter drove away on the noisy tractor. With few exceptions, I or one of my guides drive our own clients directly to the stand, usually on the back of an ATV. This keeps the deer’s attention on the vehicle rather than on the hunter we leave behind. We pick him up the same way at the end of the hunt. I tell them not to leave the stand for any reason. I don’t want him to do anything that might help a deer pinpoint the stand location. When hunting on my own, I try to get to the stand with as little disturbance as possible, a prime consideration when locating tree stands and ground blinds. During summer, long before hunting seasons open, I may use a heavy-duty steel-bladed weed eater to clear a trail to the stand, to provide quieter ingress and egress later when actually hunting. Not having to bust through brush and weeds also makes it easier to leave less human scent on the way into the stand. A single misstep may be enough to spook a mature buck out of the area. That evening, after a long and uneventful afternoon on stand, and with only a few minutes of shooting light left, I arrowed a heavily antlered 150-class whitetail. The temperature was still in the high 70s. During my evenings in that outfitter’s elevated tree stands, I’d watched a number of shooter bucks from afar, moving out of a brush-choked oxbow along the river and then across an open stretch of sagebrush, passing by a fence corner on their way to crop fields. There was nowhere to hang a stand, but I told the outfitter that the fence corner would be a superb place for a pit blind. He’d never dug a pit blind before, but he dug one after the season and brushed it in, even planting some live bushes the following spring. He called early that fall to tell me two clients had taken good bucks out of the blind. Scouting while hunting, coupled with an open mind, will often show you a better way to hunt a difficult location or situation. In warm weather, when the hunting can be especially challenging, it pays to consider off-the-wall tactics. In general, the early season calls for more thorough scouting to pinpoint stands where you can get within bow range of a deer that may only present itself early in the morning or late in the afternoon. In fact, you may be better off spending more of your time scouting than hunting. Watching deer from a distance with binoculars reduces the risk of them patterning you or being spooked and changing their patterns. Once you pinpoint the best possible ambush location, you can move in for the kill. The final challenge of warm weather hunting doesn’t surface until after the shot. In summer-like heat, a dead deer may spoil quickly, making it difficult to judge when you need to push for a quick recovery or lay back and let nature take its course. If you bump a wounded deer in any weather, it will run, and your chances of recovery go down considerably. In cool weather, I rarely if ever pursue a hit deer until I am positive it has had a chance to go down for the count. Waiting an hour to take up the trail isn’t nearly long enough. In fact, 4 to 6 hours is often too soon. If I think a deer may be gut-shot, I wait 12 to 24 hours. On numerous occasions, after waiting overnight to take up the trail, I’ve found deer that lay down and died nearby, but only a few hours before. Patience is a virtue in recovering shot deer, a virtue that is often tested by hot weather. It’s a much tougher call when you know that deer may be spoiling. No doubt about it, the warm weather of the early season poses some of the toughest challenges a whitetail hunter ever encounters. Do it right, however, and you may hunt bucks that are less spooky than they will be later in the season, when the hunting pressure builds. But you must take full advantage of every opportunity.